In reality, Brigham Young and other LDS leaders have welcomed other denominations to build their religions in Salt Lake City. By the time the transcontinental railroad was completed in Utah 1869 many other churches already had a foothold in Utah to serve non-Mormon mine and railroad workers. 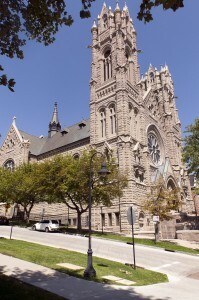 The Catholics, Presbyterians, Jews, Episcopalians, and Greek Orthodox all established themselves late in the 19th century and built large stately churches in Salt Lake City. These architectural masterpieces make Salt Lake City a rich venue for tourists interested in more than just Temple Square. Three architecturally significant churches were completed in the early years of the twentieth century, just a short hike from the Temple. 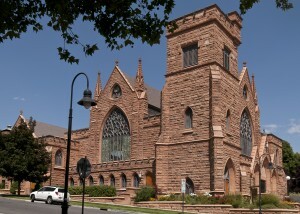 Completed in 1871, St. Mark’s Episcopal Cathedral predates the Mormon Temple in Temple Square (1893) and is said to be the oldest, continuously used worship building in Utah. 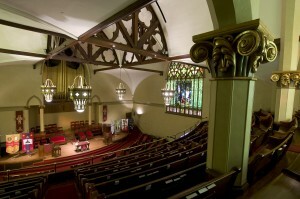 It is the third oldest Episcopal cathedral in the U.S. and is located at 231 East 300 South. In 1880, two schools were established by the Episcopal Church – St. Mark’s School for boys and Rowland Hall for girls. The current day Rowland Hall St. Mark’s School is a merger of the two schools educating K – 12 students. The majestic First Presbyterian Church is at the corner of C Street and South Temple. 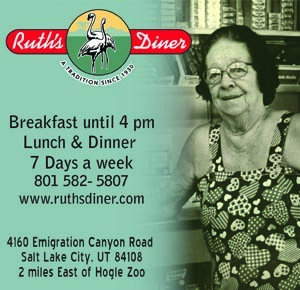 It is constructed from red sandstone quarried at Red Butte Canyon and hauled to the site by wagons. The church was dedicated in 1906. 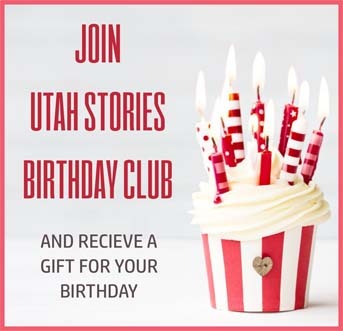 Presbyterian history in Utah can be traced back to 1871 when its faithful were relegated to a Salt Lake hall over a livery stable because “Brigham Young had closed to the ‘Gentiles’ (non-Mormons) every hall and public place in the city” according to the First Presbyterian website. The early Utah Presbyterians started the Salt Lake Collegiate Institute as a mission school in the basement of the original church site at Second East and Second South in 1875. The Collegiate Institute later became Westminster College and moved to its present location in 1902 and severed its ties with the church in 1974. The massive sandstone Catholic Cathedral of the Madeleine just one block west of First Presbyterian is the closest church to the Temple. It was completed in 1909 after almost ten years of construction. It is the only church under the patronage of St. Mary Magdalene in the U.S. Some historians say the St. Magdalene moniker, chosen by Utah’s first Catholic Bishop, Lawrence Scanlan, was selected because the feast of St. Mary Magdalene is July 22, just two days prior to the important Mormon annual celebration of Pioneer Days. The present day Madeleine name is the French version of Magdalene, and was changed by Bishop Joseph Glass, the second bishop of SLC, in 1916 after he visited the St. Madeleine burial site in France. The Catholic presence in Utah predates the Mormon emigration with the exploration of the region by Franciscan missionaries in 1776. Regional geographical names such as the San Juans, Santa Clara, the Virgin River and Monte Cristo are remnants of the Spanish explorations. When federal troops established Camp Floyd near Salt Lake in 1859 to keep an eye on the unruly Brigham Young and his followers, a Catholic priest arrived soon afterwards. By the beginning of the Civil War, Camp Floyd was abandoned but theCatholic priest stayed. There is evidence that the LDS church and the Catholics began a long cordial association. In 1866, Reverend Edward Kelly enlisted the aid of Brigham Young to help settle a dispute over some downtown Salt Lake City land purchased for a church. In 1871, Utah’s first Catholic Church was dedicated. A couple blocks west of the current site of the Cathedral of the Madeleine.